John Brennan, Obama’s CIA Spook and [naturally] the latest Trump detractor. UPDATE 4/27/18: So please remind us again: who’s colluding with foreign powers to fix the election? UPDATE 2/16/18: More breaking news (repeating and repeating and repeating what we’ve known for a year) about the whole Russia dossier farce as a John Brennan production. Any chance there’s a point where truth rears its head and says, once and for all, “Enough! La commedia e finita!”? UPDATE 8/11/17: Even confirmed Lefty journalists with a smidgeon of integrity like Seymour Hirsch verify that the Russian Fable is just that and the work of one treasonous Deep Stater named John Brennan. Reward traitors, punish patriots. Kill your friends, exalt your enemies. That’s the Left for you. UPDATE 3/7/17: All this spooky talk about Russians, wiretapping, all designed to undermine Trump: do all roads lead back to Brennan, the spook of spooks? Happily, there’s a real problem for those claiming Russian infiltration into the election who now find themselves explaining away their own infiltration? Projection, projection, projection in service to deflection, deflection, deflection. UPDATE 2/17/17: Another unfortunate leftover from ObamaWorld, Brennan is determined to make mischief as long as he has the power to do so. Naturally Obama wouldn’t pick anyone but a serial subversive to be CIA Chief, and he found the one born for the job in John Brennan. 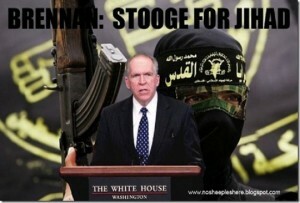 By every indication a Muslim sympathizer if not officially a Muslim…a “Useful Infidel,” just like his Boss! Adding lustre to his subversion credentials, he even has admitted to voting Communist! The latest witless, dishonest fool to attack/undermine Trump via the so-called “Russian Dossier and find it all boomerang on him. Another deserving recipient of The Trump Effect. That should be defined as covert, subversive lies coming up against overt, aggressive truth, a refreshing new development in our political climate. 2 Responses to John Brennan, Obama’s CIA Spook and [naturally] the latest Trump detractor. The great irony is that whatever these clowns do or say, it just makes them look more and more what they really are!!!! !